So here I am still on a quest for the best gluten free bread. The photo is my first attempt at making gluten free bread from a recipe. Ingredients: brown rice flour, tapioca starch/flour, cornstarch, flaxseed meal, xanthan gum, salt, olive oil, honey, 2 eggs, 2 egg whites, yeast and cider vinegar. It does taste like bread but also has other mildly unpleasant tastes. Tapioca flour is one of those tastes that I'm not really sure about, however it is in the ingredients for a reason, as I found out. Generally the bread has a good texture though and is an improvement on rice cakes! There is a lot you can't do with rice cakes. 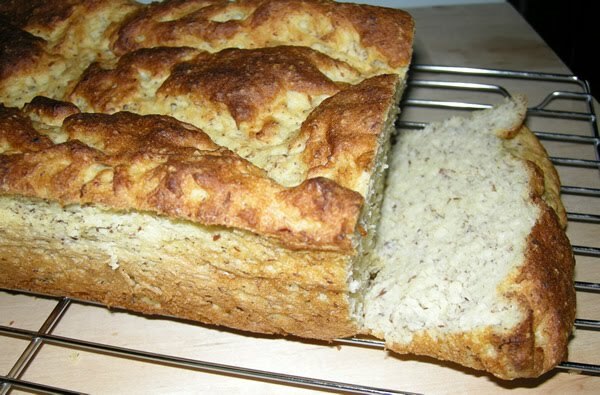 Making gluten free bread is very different from making regular gluten bread. It reacts very differently and to create the same taste and texture there are various steps and ingredients that are essential for a risen loaf. 1. Yeast - As with regular bread to make a rising loaf yeast is used. Gluten free bread won't ever rise twice, but only once and can double in size. 2. Some flour essentials. Sorgham flour is a good wheat flour replacer but tends to be dry, however in combination with the other ingredients it works well. Tapioca flour helps to bind the mixture and create a good final consistency. If you replace the Tapioca flour with rice for example, the end result will be less 'springy' and more on the dry and crumbly side. 3. Xanthum Gum is a fermented corn sugar which acts as a gluten replacement, so is almost always required. The amount will vary depending on whether it's required for bread, pastry, cookies or cakes. 4. Eggs are essential in gluten free bread and for those not eating eggs, there is egg replacer. The eggs help to give the bread the right consistency, hold it together and and help it to rise. 5. Temperature is key, the warmer the better for the liquid ingredients (around 100 degrees) and room temperature for the eggs and flour. The good news is once you have all the flour and ingredients it is quite straightforward to make. The benefits of baking are it tastes better, is fresher and is more economical.